Spiders come in all sorts of shapes and sizes, and there is no shortage of them in the temperate climate Southern Florida provides practically year-round. Some spiders are capable of potent bites, while others are harmless. - Spiny Orb Weaver (Crab Spiders) -These are very common throughout most of Florida, commonly seen as small “crab-like” spiders hanging between plants in your yard or along the eaves of the home. They have a black mouth and legs, and a round-white body with red tips along the edges. These spiders can be seen hanging from the screen enclosures in backyards, along fence posts, and in the shrubbery scattered around a property or home. The Spiny Orb Weaver is a harmless spider to humans. - Daddy-Long Leg - The Daddy Long Leg Spider, commonly referred to as cellar spider is a light brown spider distinguished by its very thin body frame and its legs appearing to be much lnger than its body. This species of spider finds residence in “still” areas of homes, workplaces, and properties such as in corners, beneath furniture or desks, and scattered throughout areas known to collect dust and moisture. They are active year-round (mainly at night), yet pose no real threat to humans as they are very frail and in some cases even tough to see. - Wolf Spider - The Wolf Spider is a relatively large species of spider here in Florida, reaching about 2 inches in length. These spiders are hairy and have patterns of gray, brown, and black on their big bodies helping to distinguish them from other species. They do not normally bite, but have bitten those that provoke the spider into doing so with a non-poisonous bite. These spiders are also active year-round as they find home in our relatively stable, warm climate. - Jumping Spider - The Jumping Spider is a very common spider seen around the outside of homes in the broad daylight. These spiders are seen scurrying along the walls and creases of the home, as they forage for food mainly in the sunny hours of the day. They have a distinct appearance with a bright white stripe going straight down their bodies towards their large eyes. Typically about ¼ inch in length, the Jumping spider is a fast-moving spider, jolting around with quick, sudden movements when provoked. Typically, this species is considered harmless to humans and does not typically bite. - Banana Spider - The banana spider is known for its fierce, colorful look and its size that is much bigger than the Crab or Daddy Long-Leg Spider. These spiders form large, intricate webs predominately outside in forests and heavy ornamentals. They have large, long legs and bright yellow, gold, and white markings. They are typically only found outdoors, and shy away from human activity for the most part, yet can dish out a painful sting if provoked. 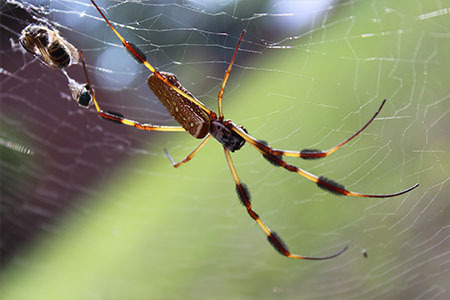 Banana Spiders typically feed on small insects, mosquitos, beetles, etc.